One of my birthday-inspired stories was published in the 9th Issue of Luna Station Quarterly earlier this month. Luna Station Quarterly is a magazine that focuses on speculative fiction by women writers. 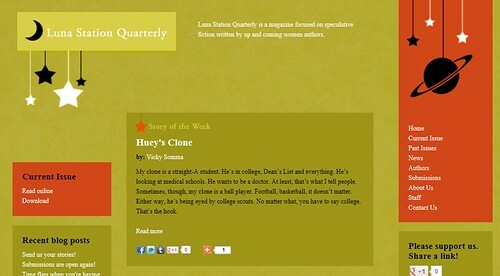 “Huey’s Clone” is currently highlighted as the “Story of the Week”. You can read the story online or download the full issue in PDF format. P.S.S. If you are a woman writer, Luna Station Quarterly is currently accepting submissions for their next issue! Ryan Somma and I had a bit of our own version of “March Madness” this year. Our work had three big upgrades/migrations all in the same month which has kept us incredibly busy and required our continued attention over the weekends. Our first non-workday in March fell on the 17th when we went out for my birthday hike. 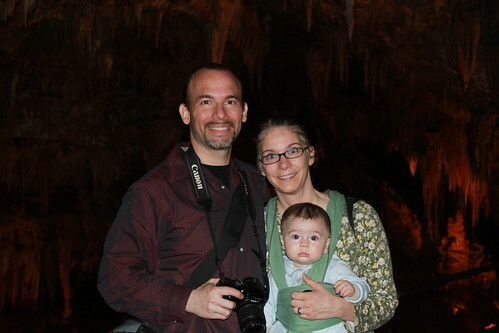 Our next day off was on the 22nd when we accompanied AmiExpat’s Christina and her two sons to Luray Caverns. 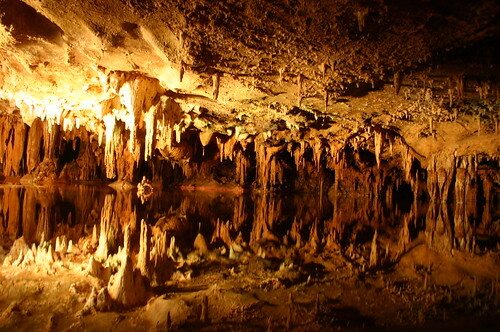 Located just outside of Shenadoah National Park, Luray Caverns was discovered in 1878. 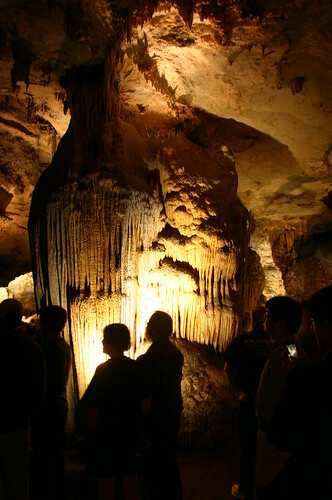 The one hour tour takes you along 1.25 easy miles through the caverns. Strollers are permitted in the caverns. However, there are two sets of stairs. We found our usual Moby Wrap to be a wonderful compliment to the tour. 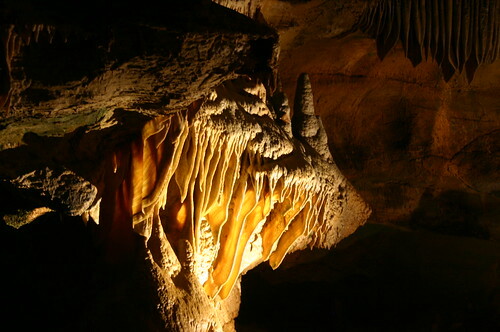 Although the caverns are considered an “active cave”, the formations only grow a cubic inch every 120 years. That means young Sagan’s eyes were seeing beauty that for all intensive purposes is identical to the beauty I saw when I last visited in high school. 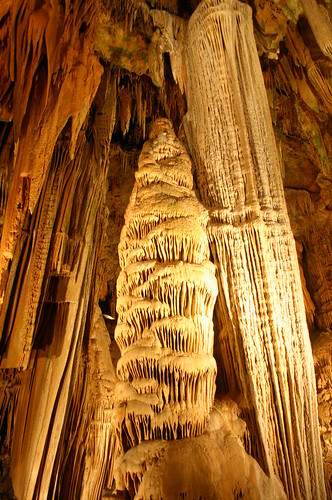 I found how slowly the formations grow to be the most thought-provoking aspect of the tour. Some of the formations, like the drapery of Saracen’s Tent, were thin and delicate. Some, like the Double Column or the Giant Redwood, towered formidably over us. Some were yellow, some were orange, some were alabaster white. But all the formations shared a commonality–they were formed slowly, drip by drip, over the course of millions of years. We were witnesses to the power of small, almost invisible, change and what amazing and intricate things can be accomplished with time. I was looking upon stone but I left with a much greater appreciation of the organisms above ground. 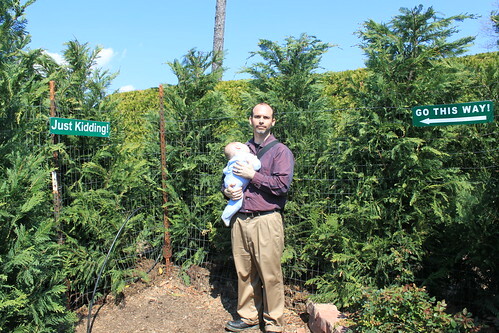 After the caverns, we visited the Garden Maze. I thought I was being all sneaky by looking at an aerial shot in Google Maps the night before. When we arrived, all the brochures and signs featured a similiar view. It turns out knowing the layout doesn’t really help. You weren’t merely trying to find an exit, you had to first find four hidden stations along the way. Google Maps also didn’t help us avoid misleading signs. We finished our day with a quick and yummy lunch at nearby Artisan’s Grill. We may have only had two days off in March, but with a filled day like this one, we sure did make up for lost time. 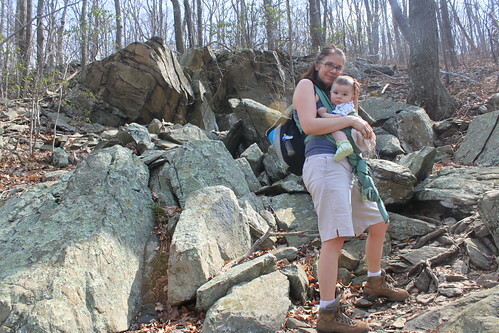 The best part about my 37th Birthday Hike was including my eight month old son. 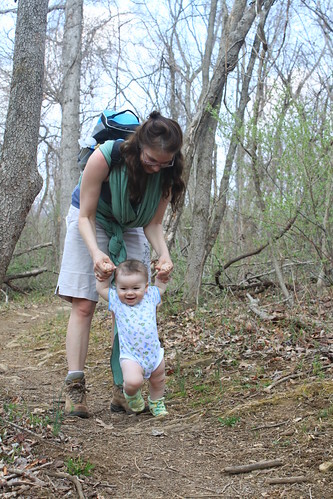 We drove by the Appalachian Trail when he was 14 weeks old, but this was the first time Sagan actually got to be on the trail! He rode most of the way in his Moby Wrap. He slept through most of the ascent and the old apple orchard when we hiked southbound. 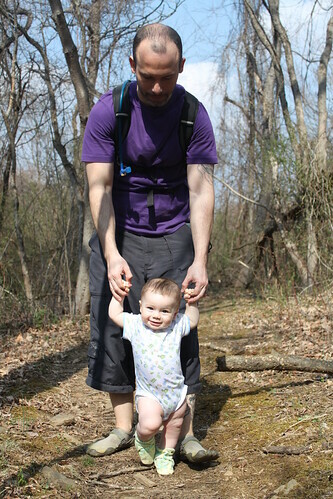 When he woke up, he got to do some [assisted] hiking of his own. He joined us for our lunch on the trail and took a surprise liking to a kiwi. 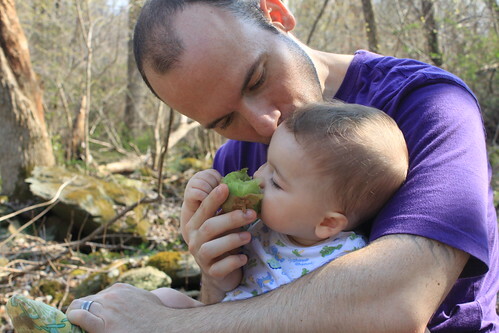 Sagan kept pulling the kiwi back to his mouth and sucked it like a vampire. 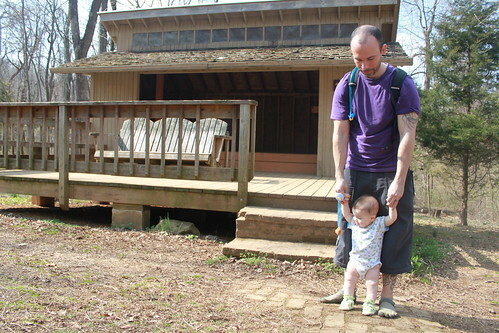 When we arrived at the Jim & Molly Denton Shelter, Sagan was ready for some more walking practice. And by the time we were climbing down the mountain, he was sound asleep in his Moby Wrap again. Sagan has a lot of “firsts” to come and I’m sure they will weasle a way into my heart. 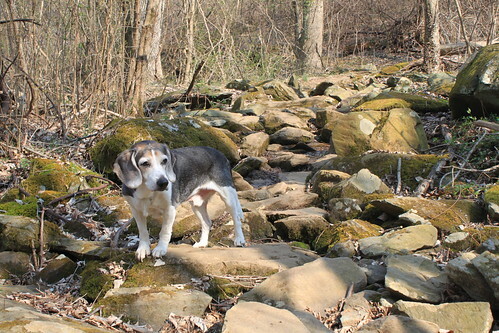 But “First A.T. Hike”… that memory is already cemented. 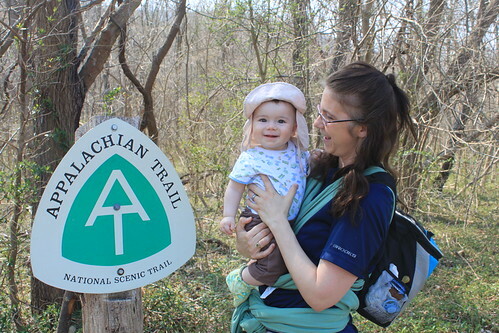 This year for my annual birthday hike, Ryan Somma and I introduced eight-month old Sagan to the Appalachian Trail! After some research, I found there was an AT crossing just an hour away from our home! The trail crosses VA-55 and under I-66 in Linden, Virginia. We hiked from the VA-55 trailhead southbound in Manassas Gap to the Jim & Molly Denton Shelter and then turned around for a six mile round trip. The trailhead at VA-55 is well marked with a nice prominent sign announcing it is the Appalachian Trail. You cross over Goose Creek on a bridge and then you have a nice wooden walkway to keep your feet dry during flooding season. Almost immediately you cross over some railroad tracks and then you begin a pleasant ascent. I say pleasant because I found the grade and the switchbacks to all be quite manageable, even carrying an eight month old. There are rocky portions, but nothing too severe or trecherous. 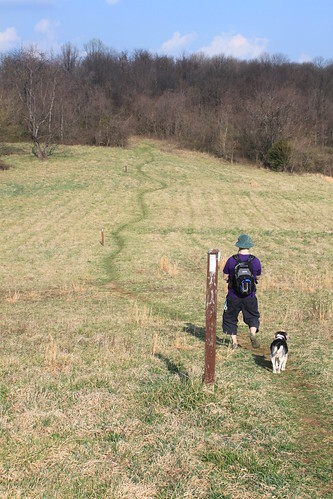 The trail starts to flatten out and you enter a large field reminiscent of Grayson Highlands. The trail reenters the woods, passes close to the homes of some individuals I now envy dearly and crosses over Fiery Run Road. There are some slight ups and downs and a couple of creek crossings before you hit upon the Jim & Molly Denton Shelter. This shelter is nicknamed “The Hiker’s Hilton” and with good cause. It is quite a fancy shelter, featuring large adirondack chairs… and a rain barrell shower! Wouldn’t Be Nice to Live Here? I’m sorry to report that I didn’t pay that much attention to the dormant trees we were passing. I know from the Virginia Hiking, Manassas Gap South video that this section homes Sassafras and the field has remnants of an old Apple Orchard. 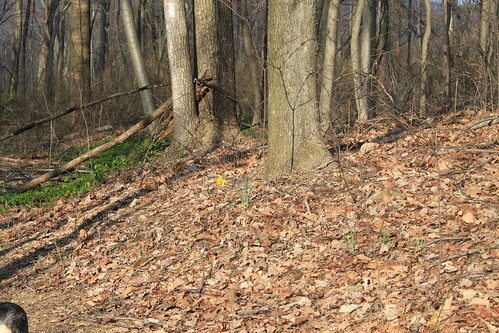 We did document the first spring activity of a couple of trees and were surprised by one lone daffodil who made a home in the middle of the woods. Although we saw a hawk on our drive to the trailhead, fauna sightings were pretty scarce this hike. 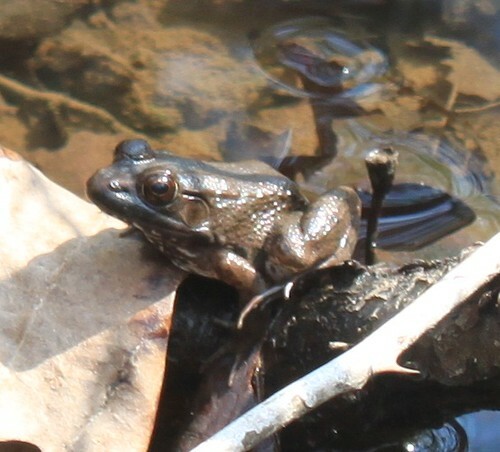 Ryan did catch a shot of a frog at a creek crossing south of Firey Run Road. Finally, like my 35th Birthday Hike we were serenaded by spring peepers near the end of our journey. 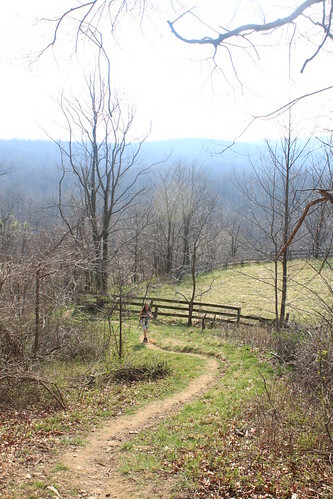 When I lived in Blacksburg, Virginia, I had many nearby Appalachian Trailheads to choose from. My options are more limited here in Occoquan Virginia, but I have to say the trailhead closest to me is most satisfying. There is a whole lot to see in just three miles. 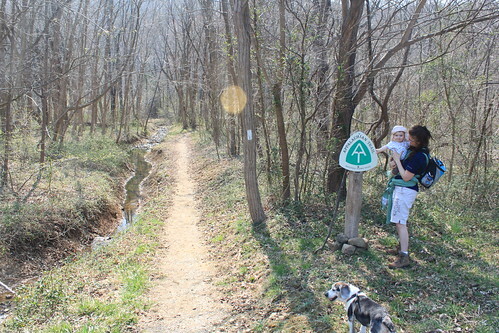 More pictures of our Appalachian Trail Hike from VA-55 to Denton Shelter can be found on my Flickr site. March 6th was the six year anniversary of this blog! On my three year anniversary I highlighted ten of my favorite posts from my first three years. Here are ten more that I fancy from the next three years (March 2009 – March 2012). Hehe. I dunno. I may just like this one because it has underwear in the title. A great hike can be had in every season…particularly frozen waterfall season. With roughly 13,000 views to date, this post was the most popular of my Survivor Tree series. Adventure Day with the Neighborhood Kids — Canoeing! 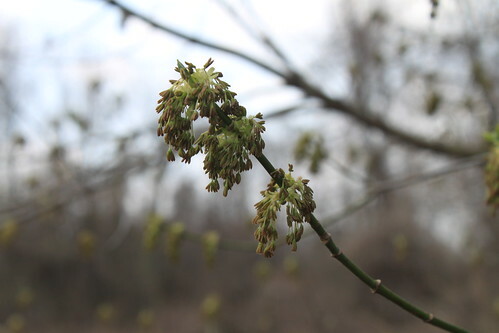 Our experience with growing potentially blight-resistant American chestnuts from the American Chestnut Foundation…and the importance of trying again. 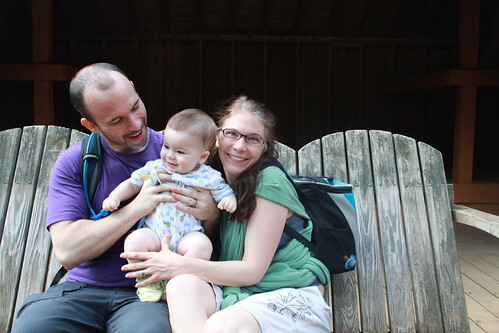 Our Birth Story, the Bradley Method and a Little Bit of Hiking Too! It took me twelve weeks to finish writing up my post. That labor of love took longer than actual labor! My father can make me nearly asphyxiate with laughter… and he can dispense some pretty handy advice as well. I love these patterns in nature posts. I may not always have as much time to blog as I would like– but I always find it to be a very fulfilling activity. Thank you for reading!! !